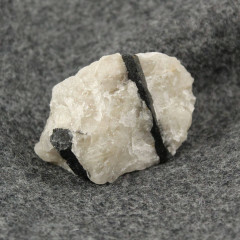 Not to be confused with Rutilated Quartz, this stone has dark or black needle like crystals of Tourmaline growing through it. This stone is similar to Rutilated Quartz – instead of the golden needles of Rutile, there are darker needles of Tourmaline – they are typically black, but there are samples with green or even blue needle crystals, although these are much rarer. It is sometimes known as ‘Tourmaline in Quartz’ or ‘Tourmilated Quartz’. 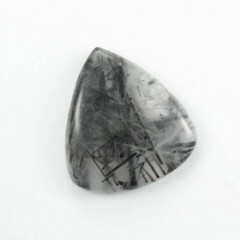 It is almost always sold polished or tumbled, to show off the interesting interior – it is sometimes cut into cabochons or pendants, but rarely faceted, as larger pieces are better to show off the inside. 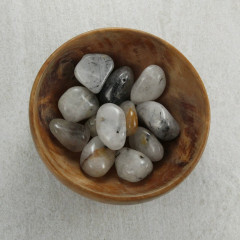 It is considered to be a protective and healing stone, which brings inner strength, and may help with depression and anxiety. It is related to the Crown chakra. The stone is thought to have the healing properties of both Tourmaline and Clear Quartz.